Upper exterior of la Casa Batlló in Barcelona, designed by Antoni Gaudí between 1904 and 1906. Photograph by Bernard Gagnon via the Wikimedia Commons . Art history students in Barcelona are trading in traditional homework to share their learning about Catalan Modernism , or modernisme in Catalan, with the world. 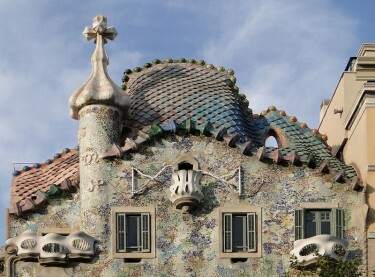 If you have ever visited Barcelona, you will remember the colorful and curvilinear architecture of Antoni Gaudí ’s fantastical buildings. Gaudí is essentially the crown jewel of the region's art, and the foundation of this organic and dreamy aesthetic is the political and cultural revolutionary movement that sought to transform Catalan society at the turn of the twentieth century. Artistically, modernisme was an eclectic movement inspired by similar currents from other European countries, such as French Art Nouveau, but was nevertheless charged with a nationalist sensibility that has given it a unique personality. After assessing a relatively low level of quality of Wikipedia's content on the subject, a group of Catalan wikimedians  [ca] launched a thrilling new wikiproject : Viquimodernisme  [ca], which has three aims: “improving the presence of Catalan Modernism on Wikipedia”, “making the knowledge generated at the University level accessible on the Internet” and “putting into practice new paradigms of open education”. 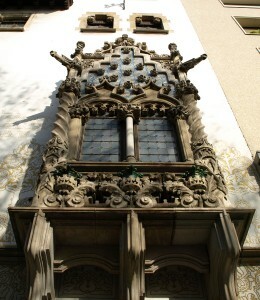 Façade of la Casa Macaya, designed by Josep Puig i Cadafalch in 1901. Photograph by Mutari  [public domain] via the Wikimedia Commons . During the first semester of the academic year 2012-2013, more than one hundred art history students  [ca] from the University of Barcelona produced quality Wikipedia articles instead of completing traditional course work, under the supervision of six teachers and researchers belonging to the GRACMON  [ca], the group of research for contemporary art and design at the University of Barcelona. They have created and edited more than a hundred articles pertaining to Catalan Modernism so far. The proposal came from Àlex Hinojo (@Kippelboy ), active #glamwiki  [ca] member, an international group of wikimedians who work in order to increase ties between cultural institutions and the free knowledge network. Besides being one of the most active wikipedians, Hinojo is the person behind the project @CatalanMuseums , offering information in English about the museums of Barcelona and Catalonia. Suspicions soon gave way to curiosity and this was also replaced by the enthusiasm inspired by an unprecedented proposal. […] Considering that Wikipedia usually occupies the top positions on Internet search engines and that it is often the first, and usually the only resource consulted by most of the population to satisfy their doubts or curiosity, it makes sense to propose that the information and data available in this online encyclopedia be correct and adequate. Suspicion is often the result of ignoring a specific subject. That’s why we develop these types of projects, so we can approach different spheres. One thing that teachers repeat the most is: “I wasn’t aware either of the level of control enforced by volunteers or the level of quality filter processes that Wikipedia has. Wikipedians are even more “pernickety” than teachers”. GLAM wikiprojects try to involve professionals from cultural institutions so they can coalesce to share their knowledge freely. In the case of Viquimodernisme, Solé and Hinojo were responsible for bringing that collaborative working culture which characterizes Wikipedia community to the GRACMON professors, world authorities on Catalan Modernism. Instead of performing traditional course work in the form of stapled sheets of paper that probably ended up in the trash bin, students had to edit Wikipedia articles. […] Thus participants were immersed in a world of encyclopedic language, where the syntax –code-wiki– seemed weird, where the community of Wikipedia editors was actively involved and intervened in a work that didn’t belong to the student anymore for it had become free and available to anyone thanks to creative commons licenses. The survey conducted in January 2013 by the project's coordinators demonstrates the participating students’ enthusiasm. Graph courtesy of ESM, via the Wikimedia Commons . Articles have been improved, especially in Catalan, but they have also edited articles in Spanish, French and English. Project managers made an inquiry to evaluate its development by the end of the first semester, on January 2013. You can check the results here  [ca]. After these first months of the project, Hinojo points out the positive fact that “students find it really useful that their work has been ‘published’ in Wikipedia and is available to everybody”. Viquimodernisme belongs to a type of wikiprojects known as GLAM  [ca] (Galleries, Libraries, Archives and Museums), an international initiative that was born after the people in charge of the British Museum  realized many articles talked about their institution on Wikipedia and decided to hire a wikipedian to correct and widen the existing content. Since then, this initiative has been exported to other countries and institutions. Viquimodernisme has raised interest among some academic institutions, and the coordinators hope  the project will become a model for others in the future. They will present their final results  at the CoupdeFouet International Art Noveau Congress  [ca] to be held in Barcelona on June 2013, which coincides with the project's end. Violeta Camarasa  co-authored this article. Cristina Simón collaborated in its translation into English.